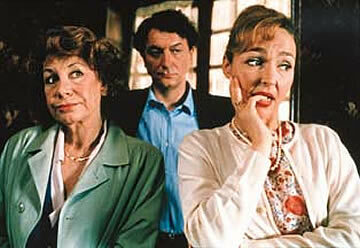 UN AIR DE FAMILLE is a witty and incisive comedy about family politics played out one evening at a small suburban cafe. Based on the hugely successful French play of the same name, Un Air de Famille is a tour de force of verbal joust no and pitch perfect ensemble acting. Shot in cinemascope and set in nearly real tme, the film uncovers some universal truths about family life. "This droll symphony of comic disenchantment is as perfectly balanced and execut ed as the timepiece of your dreams"
"One of the years ten best films... Klapisch's tremendous comedy-drama is the year's most overlooked treasure." "This is a must-see for anyone with a family and its eternally unfinished business."